Why settle for an average makeup artist in Anchorage, AK when you could have a team of estheticians making sure that you look your best for your special day? Georgia Lopez, the owner of Lux Skin and Makeup Studio, and Taylor Conway, a professional esthetician, are dedicated to meeting all of their bride’s dreams for their look. As they want to offer their services to as many residents of the city as possible they have always worked to make their prices some of the most competitive in the state. Julia’s Hair Salon is a team of some of the leading hair stylists in Anchorage but they also provide nail services and expert makeup assistance. This means that you will be able to go to one salon for all of your wedding hair and makeup needs. Knowing that your bridal look is in the hands of true experts means that you will be able to relax and enjoy getting ready for your wedding. Simply viewing their gallery will have you convinced that they are the best in Alaska. The main focus of the stylists at Salon Nirvana is to make you feel absolutely stunning. This has inspired this salon to offer a full range of services that will ensure that every future bride that comes to them will turn every head on her wedding day. While they do offer haircuts, skin treatments, waxing, eye defining and a range of other services, their most talked about talent is providing bridal makeup. With a consultation included in their set price of $65 they are also one of the most affordable options in Anchorage. For a modern bride the idea of having to redo a makeup look every day is anything but appealing. As the trend for opting for permanent makeup is developing there are more Anchorage makeup artists offering it. Only Deena Williams at Ageless Beauty can really provide the quality of permanent options that you can fully trust. She uses a completely safe method that gets incredibly natural results. 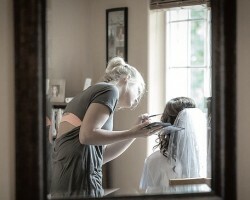 After visiting this salon you will have a professional base for your makeup when the big day arrives. 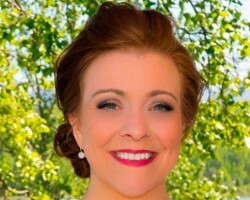 Since Katy Bakker started offering her makeup services in Anchorage and the surrounding area she has worked on a huge range of clients for every imaginable event. Her passion for what she does comes through in her work and it is constantly mentioned in reviews of Katy’s work that she makes having your makeup applied a highly enjoyable experience. In addition to loving what she does, Katy believes it is a true honor to be a part of someone’s wedding preparation.